Price is 13% below the initial Lego retail price, a € 16.94 discount! This comes down to 5.74 cent per brick. The LEGO® NASA Apollo Saturn V (21309) Lego set is available from the sites below. However, they do not offer delivery to your selected region. 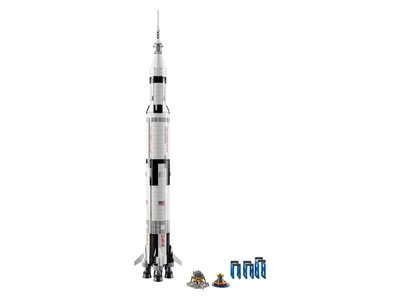 The LEGO® NASA Apollo Saturn V (21309) Lego set is no longer directly available from the sites below. However, 3rd party partners of these sites might still have the set available. Alternate description Build the first rocket to land people on the Moon! Very nice to build. Sturdy build and very nice to display. With 1969 LEGO elements the 21309 NASA Apollo Saturn V rockets its way into LEGO Ideas history as the tallest LEGO Ideas set, as well as the one containing the most elements till now.